This is the most horrible story I've read this year, although it's only February. It's inconceivable that such disgusting prison conditions could exist anywhere in the world. Relatives wailed in grief or stared stoically as flowers were placed on 20 caskets at a mass funeral Tuesday for the latest group of inmates who died miserably in Haiti's largest prison, most without ever having been convicted of any crime. "One thing an investigating judge seeks in a criminal investigation is criminal intentions on the part of the people involved and there is nothing that shows that criminal intention on the part of the Americans," the [judicial]source said. Haitian jails have always been miserable places. I hope this report is correct. 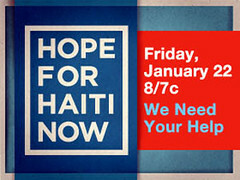 If you're watching the Hope for Haiti Now telethon, let us know what you think. If you aren't by a tv, it is being live streamed online globally across sites including YouTube, Hulu, MySpace, Fancast, AOL, MSN.com, Yahoo, Bing.com, BET.com, CNN.com, MTV.com, VH1.com and Rhapsody, and on mobile via Alltel, AT&T, Sprint, Verizon and FloTV. Here are the details for Hope for Haiti Now: A Global Benefit for Earthquake Relief, a telethon which will be aired live tonight across the globe. Hosts for the event are: George Clooney in Los Angeles, Wyclef Jean in New York and Cooper in Haiti. It's important to keep the devastating news from Haiti at the top of our consciousness. The news is no longer 24/7, but the nightmare continues. ....In the squatter camps now scattered across this capital, there are still people writhing in pain, their injuries bound up by relatives but not yet seen by a doctor eight days after the quake struck. On top of that, the many bodies still in the wreckage increase the risk of diseases spreading, especially, experts say, if there is rain. Back in 2004, plans were made to house up to 50,000 boat people from Haiti who had fled trying to get to the U.S. at Guantanamo. The idea was to hold them at Guantanamo until they could be returned to Haiti. Now, the U.S. is planning to do it again. The U.S. has begun preparing tents at Guantanamo Bay for Haitians migrants in case of a mass migration spurred by the earthquake, a senior official at the base said Wednesday. About 100 tents, each capable of holding 10 people, have been erected and authorities have more than 1,000 more on hand in case waves of Haitians leave their homeland and are captured at sea, said Navy Rear Adm. Thomas Copeman. Despite the world-wide effort to get supplies, food, medical care and security forces to the people of Haiti, it's not happening fast enough. Violence is growing and spreading. Police opened fire on a group of looters, killing at least one of them, as hundreds of rioters ransacked a supermarket. One, a man in his 30s, was killed outright by bullets to the head as the crowd grabbed produce in the Marche Hyppolite. Another quickly snatched the rucksack off the dead man's back as clashes continued and police reinforcements descended on the area armed with pump-action shotguns and assault rifles. What will happen to the orphaned, homeless, sick and at-risk children in Haiti, who make up more than half of the country's population? Efforts are underway by Catholic Legal Services in South Florida to bring many here, for adoption, foster care or other placement. This was done for Cuban children in Operation Pedro Pan in the 1960s. What's needed: Passports, Emergency visas, the granting of refugee status, faster paperwork processing. We really need to get the injured children to places with adequate surgical and medical facilities. Hillary Clinton has arrived in Haiti. It's not clear if she's going to speak right away. More here. 20,000 bodies have been recovered so far, according to the Haitian Government. The medical situation remains dismal. Update: MSNBC says she will be speaking at the airport (where she will be for four hours) and it will air her remarks live. Her plane brought supplies and will bring about 50 Americans home. She is the most senior U.S. official to visit Haiti since the earthquake. The reporters in Haiti look pretty good. Props to them, considering the conditions they are enduring. I thought I saw Anderson Cooper, at one point last night during his report from the prison pointing out the dead bodies, turn his back to camera and shake as if he was gagging. Then I dismissed it as being my imagination. After reading this, I'm not so sure. Update: Extra props to CNN's Dr. Sanjay Gupta who was the only doctor to stay overnight treating the injured at a hospital last night. The others left when ordered to for security reasons. They returned this morning. Some good news. The Obama Administration has decided, at least temporarily, to grant Temporary Protected Status to Haitians illegally in the U.S. The protection is only available to Haitians already in the country as of last Tuesday, and allows them to stay and work for 18 months. [Homeland Security Director Janet]Napolitano told reporters that the temporary legal status is an act of compassion....Temporary protected status is granted to foreigners who may not be able to return safely to their country because of a natural disaster, armed conflict or other reasons. The ruling could affect 100,000 to 200,000 Haitians in the U.S.
Secretary of State Hillary Clinton is traveling to Haiti Saturday to view the earthquake effects first-hand, meet with Haiti's President and deliver supplies. "We will also be conveying very directly and personally to the Haitian people our long-term, unwavering support, solidarity and sympathies to reinforce President Obama's message that they are not facing this crisis alone," she added. "I will also be able to see first hand the ongoing efforts and deployment of US government personnel and resources for maximum impact to support the vital lifesaving relief and recovery efforts," Clinton said. As BTD noted earlier, President Obama is traveling to Mass. Sunday to campaign for Martha Coakley. On Friday, January 22, MTV and George Clooney will host a telethon to raise money for Haiti. EW reports the show will be simulcast on ABC, NBC, HBO and CNN. President Obama has named former presidents Bill Clinton and GW Bush to lead the Haiti relief efforts.